For a while now, many have associated double-breasted suits and blazers with late night talk show hosts and actors in an amateur production of The Greats Gatsby. Suffice to say, this style of suit jacket has split people’s opinions. Say the words “double-breasted” to some and they will think of a style that’s baggy and dated, while others will think of a classy throwback. Right now, it’s a style that is making its comeback. 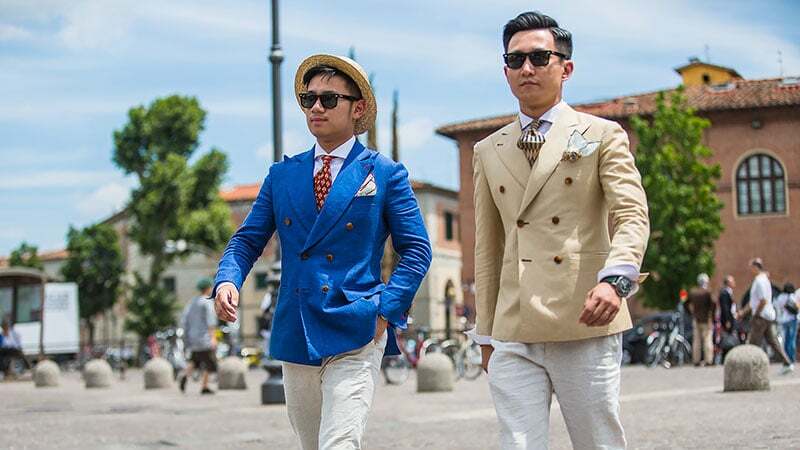 While its single-breasted counterpart has proved its versatility and continued popularity, you will want to pick the right setting for a double-breasted suit or blazer. You will also want to think about how you will wear it. With the right sensibility and style, you can nail the double-breasted look. 1 What is a Double-Breasted Suit/Blazer? 2 How Should the Double-Breasted Suit/Blazer Fit? What is a Double-Breasted Suit/Blazer? How do you pick out a double-breasted suit or blazer in a lineup? The first thing you should notice about this type of construction is its number of buttons. While a single-breasted blazer features just one column of buttons, the double-breasted construction features two rows. The blazer is traditionally wider too, with overlapping front flaps making for a heftier garment. Today, the blazer has slimmed down a little. Designers have reimagined the style for modern sensibilities, creating a fit that more closely matches a man’s silhouette than previous versions. Typically, you will see peaked lapels and six buttons. Contemporary stylings will create an aesthetic that is more subtle than those you may have seen on Wall Street in the ‘80s. Of course, many guys will choose the double-breasted option for its inherent flair. How Should the Double-Breasted Suit/Blazer Fit? It is a style with many variables. The design of the suit, along with how it’s tailored can tell a big story about you. The silhouette of today’s styling is slimmer than its boxier predecessor. If you’re looking for a double-breasted suit or blazer with modern sensibilities, opt for a blazer with a slim fit that’s cut close to your torso. Look for sleeves that are trim and armholes that are higher, as this will keep everything looking a bit more subtle. You shouldn’t expect the double-breasted blazer to fit in the same way as a single-breasted jacket. A blazer cut close to the torso looks great, but it shouldn’t hug you. Contemporary styles should pay homage to tradition while still looking relevant. The great thing about double-breasted suits and blazers is that they are incredibly versatile. You may think of the style as being too stuffy and formal for a smart-casual setting. But it is the combination of the traditional double-breasted look with a casual finish that makes for an interesting juxtaposition. For some reason, it just works. 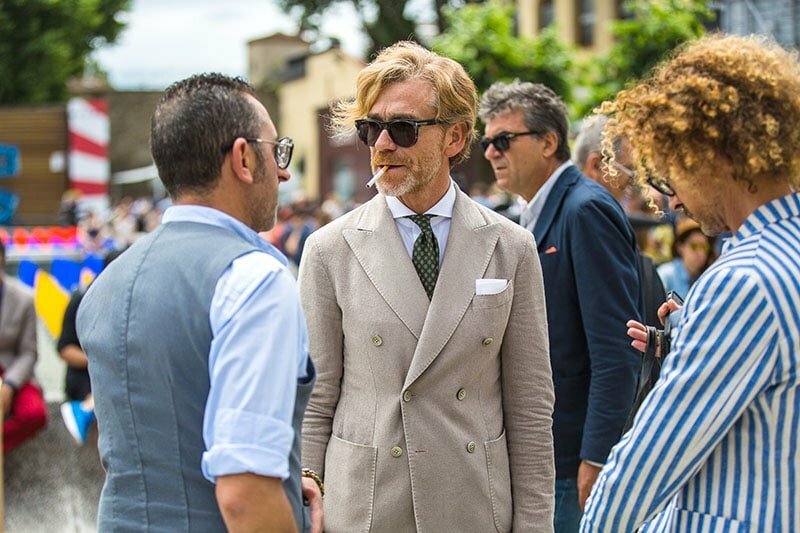 Your sartorial intuition will be the major factor in how you dress down a double-breasted suit or blazer. Combine the blazer with a pair of chinos, jeans or shorts for an unassuming approach. Bright colours are great, especially for a summer vibe. Another option is to combine a full suit with white trainers and a bright shirt. Of course, what’s happening under your jacket sets the tone. Ditch the tie and go for a t-shirt or linen shirt for a minimalist, casual style. It’s the style of dress that is a step below formal and causes great confusion for many men. Thankfully, semi-formal dress allows for a lot of your personal flair, and that’s exactly what a double-breasted suit can bring. 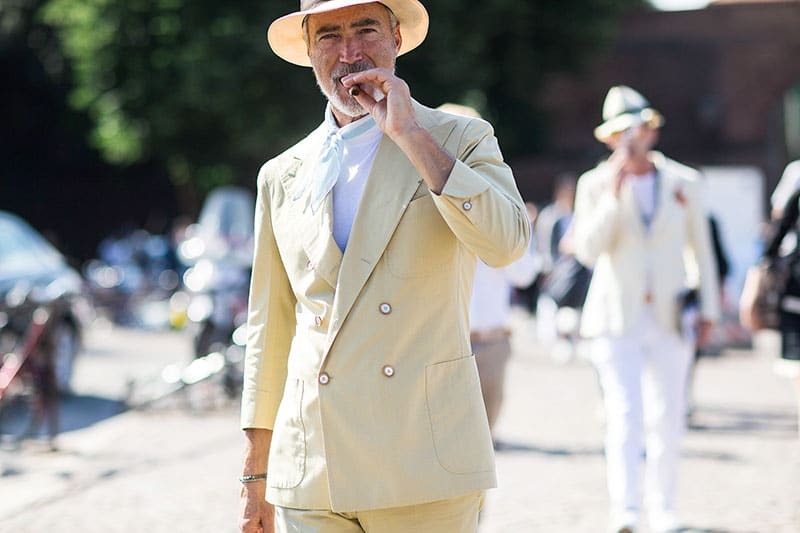 For a semi-formal suit, opt for more reserved colour choices (think creams, greys and navies. Patterns bring a lot of interest to any suit but don’t go too over the top for semi-formal. Subtle variations of Glen check, gingham and houndstooth are great options. 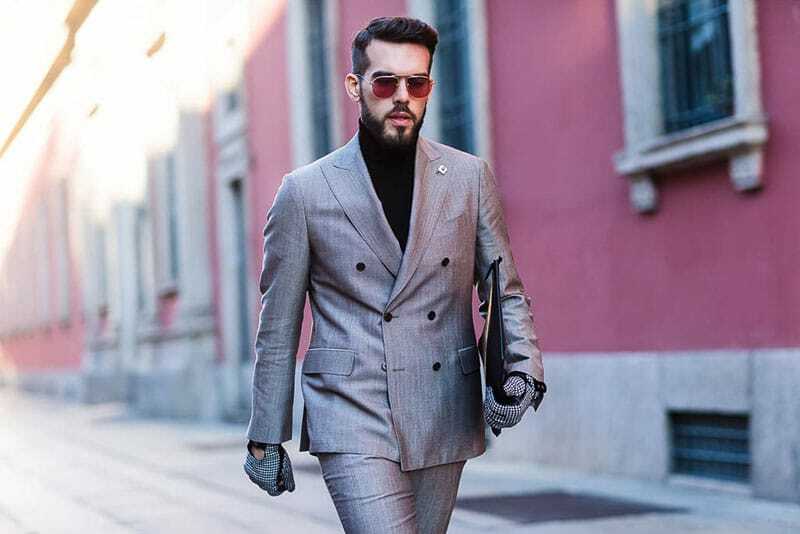 It is a style of dress without a strict definition, but at its most basic, business casual is the attire that you would wear to the office without being too corporate. If you do choose to wear your double-breasted suits or blazers to the office, you will be well-served to dress it down a notch. You don’t want to look like that ‘80s Wall Street banker. Go without a tie and wear a casual shirt or turtleneck. 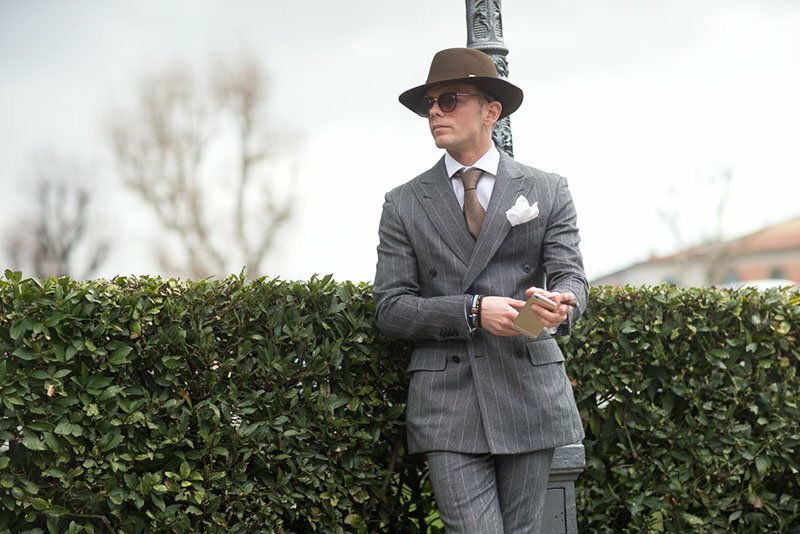 We’ve spoken a lot about how double-breasted suits can be dressed down, but remember this style inherently sits on the formal dress code. Choose a French cuff shirt paired with a darker tie to dress the suit up. Keep in mind the blazer will hide much of your tie, so a shirt with a wider collar will draw more attention to what we can see of your tie. As is the case with a single-breasted suit, darker colours reflect formal settings. With so much going on in the way of buttons, it’s easy to get confused about which buttons to button. We know with single-breasted jackets that you should leave the bottom button untouched. In the same way with a double-breasted blazer, you should leave the bottom inside button open. ith an assured sense of style. Do keep in mind, however, over-accessorising might come across as ostentatious. As a rule of thumb, the more structure that your jacket has, the more formal it will appear. Heavily structured, dark blazers are your best option if you’re looking to wear your suit to the office or formal events. With the wider fit, this style does a lot to accentuate a man’s width. The broad shoulder profile and the peak lapels can make a gent appear broad, so it’s an excellent choice for skinnier guys. For the same reason, if you’re already a broad-chested man, you may want to opt for a single-breasted blazer.